GlobeCore / News / Articles / Why regenerate transformer oil? The transformer requires less care compared with other electrical equipment. The degree of maintenance and necessary inspection for its operation depends on its capacity, on the importance within electrical system, the place of installation within the system, on the weather conditions, and the general operating conditions. The normal expected life of a power transformer is about 35-40 years. Life of a power transformer essentially means life of its insulation system comprising mainly: a) Solid dielectric [paper, varnish, cloth, pressboard]; b) Liquid dielectric [mineral oil]. Failure of a transformer in the chain causes interruption in electricity supply and dislocation of all the works going on. 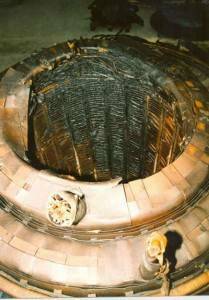 Internal causes of failure are failures of transformer insulation, failure of winding due to excessive heating, internal short circuits, failure of winding joints, ingress of moisture in the oil and insulation, deterioration of insulating oil, and failure of other auxiliary internal equipment, such as reactor of the tap changer, contacts of the tap changer etc.As transformer oil ages, it oxidizes and begins to break down. The by-products of the degradation process include acids, aldehydes, and peroxides, which bind together to form sludge. Sludge attacks the cellulose insulation, inhibits oil flow, and traps heat inside the transformer. Eventually the dielectric gap is bridged, resulting in failure of the transformer. The insulating oil (transformer oil) deteriorates gradually with use. The causes are the absorption of the moisture from the air and foreign particles that get into the oil and start to cause oxidation. Oil is oxidized by the contact with the air and this process is accelerated by the increase in the temperature in the transformer and by the contact with metals such as copper, iron, etc. In addition, the oil suffers a series of chemical reactions such as the decomposition and the polymerization that produces particles that are not dissolved in oil and that are collected in the coil and windings. These particles are called sediments. The sediments do not affect directly the dielectric breakdown, but the deposits that are formed on the winding hinder its normal refrigeration. Certainly you can change transformer oil (insulation oil) but it`s cannot resolve the problems. Up to 10% of the volume of oil in the transformer is also entrapped in the cellulose insulation; this oil contains polar compounds and can ruin large quantities of new oil. Changing the oil does not remove all the deposited sludge, especially those in the cooling fins, trapped in the solid insulation and in between the winding. These residual sludges will dissolve in the new oil and trigger the oxidation process immediately. Oil purification or degassing is also no longer effective, oil must be other change what the mostly do today or regenerated, what will be a perfect alternative. But you need to remember that regeneration does not replace purification, both of them is very important for transformer maintenance. The difference between regeneration and purification is that purification cannot remove substances such as acids, aldehides, ketones, etc. 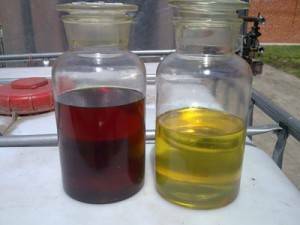 in solution, and can therefore not change or improve the colour of the oil. The regeneration process incorporates the thermo vacuum (purification) and fine filtration processes. Regenerating the oil or other insulating medium in a transformer is probably one of the few environmentally beneficial alternatives that is also cost and productivity effective at point of delivery and over the lifespan of the equipment. Regeneration should be the first option to consider in any transformer maintenance program. The aim of a preventative transformer maintenance program is to remove the decay products from the oil before they cause damage to the transformer insulation system. A well-planned preventative maintenance strategy will prevent a wet core condition and ensure that the transformer always operates in the sludge free zone. First of all, oil regeneration saves a lot of money. Regenerated oil might be better then what you are using now. It may be noted that reconditioning by centrifugal separator or filtration does not remove the acidity from the oil but will remove only sludge, dust etc. and will tend to retard the process of deterioration. Only regeneration by filters with fuller`s earth will help to reduce the acidity in the used oil and in addition improve the resistivity. The additional benefit of regeneration is it also works at its most effective whilst the transformer is energized and this also brings the benefit that there is no loss of productivity to the equipment that is fed by the transformer. We present you a world new product – installation SMM-R (UVR) by PC Globecore. Now you don`t need disconnected transformer because our plant woks with energized transformer, as result – no money loss and no unsatisfied customers. Today to keep regulators happy and customers and investors interested, you’ve got to demonstrate “green” and environmentally friendly initiatives. Our equipment can resolve this problem. Because in GlobeCore installation SMM-R (UVR) the sorbent that we use “Fuller’s earth” can be reactivated in the same system. Advantage of this technology is that you don’t need utilize exhausted sorbent, but you can use it 2-3 years without replacement. The best process for reclaiming transformer oil is treatment using Fullers Earth. The Fullers earth can be reactivated 200 to 300 times before replacement is required. Oil can be processed continuously using the same charge of Fullers Earth. No disposal of oil soaked waste is required, greatly reducing the cost of operation. Pulling vacuum on transformers and other electrical equipment. [:fr]The transformer requires less care compared with other electrical equipment. The degree of maintenance and necessary inspection for its operation depends on its capacity, on the importance within electrical system, the place of installation within the system, on the weather conditions, and the general operating conditions. The normal expected life of a power transformer is about 35-40 years. Life of a power transformer essentially means life of its insulation system comprising mainly: a) Solid dielectric [paper, varnish, cloth, pressboard]; b) Liquid dielectric [mineral oil]. The insulating oil (transformer oil) deteriorates gradually with use. The causes are the absorption of the moisture from the air and foreign particles that get into the oil and start to cause oxidation. Oil is oxidized by the contact with the air and this process is accelerated by the increase in the temperature in the transformer and by the contact with metals such as copper, iron, etc. In addition, the oil suffers a series of chemical reactions such as the decomposition and the polymerization that produces particles that are not dissolved in oil and that are collected in the coil and windings. These particles are called sediments. The sediments do not affect directly the dielectric breakdown, but the deposits that are formed on the winding hinder its normal refrigeration. Certainly you can change transformer oil (insulation oil) but it`s cannot resolve the problems. Up to 10% of the volume of oil in the transformer is also entrapped in the cellulose insulation; this oil contains polar compounds and can ruin large quantities of new oil. Changing the oil does not remove all the deposited sludge, especially those in the cooling fins, trapped in the solid insulation and in between the winding. These residual sludges will dissolve in the new oil and trigger the oxidation process immediately. Oil purification or degassing is also no longer effective, oil must be other change what the mostly do today or regenerated, what will be a perfect alternative. But you need to remember that regeneration does not replace purification, both of them is very important for transformer maintenance. The difference between regeneration and purification is that purification cannot remove substances such as acids, aldehides, ketones, etc. in solution, and can therefore not change or improve the colour of the oil. The regeneration process incorporates the thermo vacuum (purification) and fine filtration processes. Regenerating the oil or other insulating medium in a transformer is probably one of the few environmentally beneficial alternatives that is also cost and productivity effective at point of delivery and over the lifespan of the equipment.